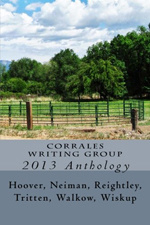 Corrales Writing Group is a closed group of six members who encourage each other in their individual writing journeys and together produce an annual anthology of essays and short pieces of fiction and memoir. The current group is made up of authors Christina Allen, Maureen Cooke, Sandi Hoover, Thomas Neiman, Jim Tritten, and Patricia Walkow. 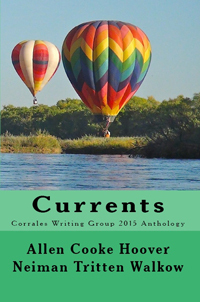 Their third anthology, Currents, was published in 2015. 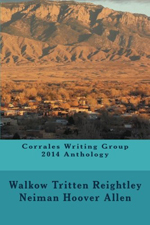 You can visit Corrales Writing Group on Facebook. If you were pitching your anthology to an agent, how would you describe Currents? Currents is an anthology to which six writers have contributed. All contributors live in the Village of Corrales, on the western flank of the Rio Grande in New Mexico. The members of the group share a love for New Mexico, and in particular, a love for the Village. Currents is the third anthology the group has produced, and over time, the constant flow of ideas and critically valuable suggestions has enriched not only our writing, but also our lives. It’s typical for works in an anthology to share a common theme, but this isn’t true of your anthologies. Why did you decide not to write to a theme? While it is true most anthologies share a common theme, the only common theme in ours is the place where the writers live—Corrales. One of the benefits to this approach is that the anthology may offer something for everyone. Another is that the book’s targeted audience does not expect a single-topic theme. The members of your group do all the work necessary to bring your books to market. What kind of learning curve did you go through to accomplish this? What was your most helpful resource? Although all members of the group are comfortable using a computer, there are varying degrees of computer literacy within the group. Three of the members spent many years working with computers and applications in their chosen professions. These were the first editors, and they found the process quite straightforward, without specific training needed. The other members of the group are learning from their experience, as the first three editors have prepared guidelines and processes for the subsequent editors to follow. We explored various independent publishing options and selected CreateSpace and Kindle Direct Publishing based upon ease of use. Frankly, anyone can master their templates. Each year your group rotates the duties necessary to publish your books. Why did you decide to do this? We decided to rotate the duties so that: (1) every member of the group gains the knowledge necessary to do each task required to publish a book, and (2) the same task does not fall on one or two people all the time. Editing is quite time-consuming and involves not only the technicalities of grammar and punctuation, but also the layout of the book, developing back and front cover options, the assignment of work, and the development and management of a schedule with a publication date at the end. 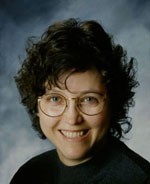 The editor manages the work to meet the scheduled publication date. The members of the group meet their due dates on their tasks. It’s a project, and the editor is the project manager. How long does it take to put the anthologies together after the stories are complete? What is your typical editing/publishing timeline? The writing and review process for the coming year’s anthology begins in December, right after the current year’s anthology is published in November. So the timeframe to write all the pieces and review them runs from December of one year through mid-July/early August of the following year. The editing process begins in August, and involves not only the editor, but each member of the group who is given specific editing assignments managed by the editor. Each piece in the anthology will be critiqued a minimum of two times within the group before the piece is considered for publication in the anthology. During the creation of the book itself, each submission is reviewed probably another four times to include thorough reviews for formatting, grammar, and consistency with other chapters. Usually at the end of all the editing, proof copies are produced and another round of editing is done. A second proof is always produced, and sometimes a third. Kindle editions are not produced until the final paper version is ready. Proofs for Kindle editions are handled online. Members share the responsibility of reviewing the final product in all the different Kindle platforms offered. The final paper version is not published until the Kindle edition is approved since we have learned that many formatting issues are not seen until reviewers look at the various Kindle platforms. What marketing strategies have brought your anthologies the most success? Our business plan was to establish an LLC (Limited Liability Company). We market our products through Amazon, Kindle, local retail sales, Facebook, Goodreads, newspapers, local media and launch parties. Since we have remained financially solvent every year, the group’s plan is to continue independently publishing our books (paperback and Ebooks) into the future. What are the goals of your writing group? How do you ensure potential members are a good fit? Individual members of the group have their own goals, but as a cohesive entity, the group seeks to achieve recognition in the writing community, as well as win awards; awards, however, are not the primary focus. Developing our craft of writing is very important to our members. In addition, in order to continue operations, the group needs to maintain fiscal solvency. Costs are constrained to permit continued annual self-sustained publication within realistic expectations of annual sales. We have learned it is best to have potential members of the group attend a meeting and decide if what we do and how we do it is something they might be willing to commit to, long-term. Commitment is a key success factor for our group. We review each other’s work before a meeting, come prepared with each piece critiqued and commented. On the rare occasion members can’t attend a meeting, they’re still expected to send their comments to the writer. Common computer literacy is another requirement of being a part of the group. It includes the use of Microsoft Word not only to write, but also review and critique. Electronic file organization is required as is the ability to effectively use websites, such as CreateSpace and Kindle Direct Publishing. Although reviews are done face-to-face at our meetings, the actual comments and critiques are sent to each other electronically. We are a closed group and no longer accept beginning writers. As a group we have come far from those early days, and we’ve learned it’s not productive for our members to be teaching a new writer all the time. Nor is it fair or healthy for a prospective writer to be overwhelmed. However, we do encourage new writers to form a group of their own, and will help them with what we have learned along the way. We have taught writing classes in New Mexico at the Corrales and Meadowlark Senior Centers. Take us through a typical group meeting. How are your meetings structured? We meet every two weeks, usually at a restaurant. Sometimes we rotate our meetings in members’ homes. One person is the facilitator of each meeting. Another person is the scribe who keeps the notes. We start by doing our reviews of new and 2nd review work. Usually we do about three to four reviews at each meeting. We use a structured process we adopted with the assistance of Rachel Hillier (associated with Central New Mexico Community College), who the original group hired to help with some aspects of writing. From our six weeks with Rachel, we have a set of standard questions we consider each time we review a piece. Writers are free to have each reviewer answer additional questions, also. Once the reviews are completed, we begin the business meeting. The Corrales Writing Group is an LLC, and we review old business and discuss new business. We assign dates for people to present their work and make any other assignments necessary for the group to function. What makes a good critique group member? Adhering to our process is a great help to the writer. We expect our members to use our standard critique questions. Not that those questions stop a reviewer from making other comments. The reviewer needs to critique the writer’s work in a way that makes it clear what is working well in the story, as well as what is unclear or repetitive, and to let the writer know what the reviewer thinks the story really is all about. The objective is not to tear anyone down, but to build up the writer. The writer always retains the right to make or not make changes based on the critiques. In general, if two or three reviewers find the same problem, the writer really should pay attention to it. For those who might want to organize their own writing group with the goal of publishing, what steps do you suggest they take? Hire or consult with someone who leaves you with a viable critique process. Make sure everyone understands being a member of the group is a commitment. Learn from those who have already independently published. Consider hiring a publishing entity, if necessary. One of the strengths of your group is how well you get along—you even socialize and travel together. What do you attribute this to? The members of the group respect our different backgrounds, opinions and experiences. It is key to our getting along…along with wine and lots of laughter. The process we use helps. Nothing is personal—it’s about the writing. We know each other’s strengths and use them effectively. Thanks for the interest in CWG and creating the interview. It was a good exercise for us to think once more about our process, what is important to us, and why we keep to this schedule. Alice Grover recommended “Corrales Writers Group” and suggested I connect you. I wrote and self published Overturned Bucket and in this first year it has sold over 600 copy, mostly by personal contact. We are on Amazon and Kindle and now, I am looking for the opportunity to reach a wider market. The book covers 400 years of evolution from the Indigenous Indians and buffalos, to the struggle to become a state to Taos, Corrales and Albuquerque. Stories are intertwined in the daily lives of the people who lived them. I would appreciate meeting with your group and hopefully attending the meeting on the 17th. Greetings Alice…you are welcome to attend our meetings and if you like what you see – join us!